Analyst is the most common entry-level logistics position. Analysts are responsible for gathering and analyzing data to look for problems. Good math and computer skills are generally required for these positions; thriving in a team setting is also important, as analysts are expected to recommend solutions to their supervisors. Although it is an entry-level position, an analyst’s tasks become more varied and complex as he or she accumulates experience. The basic understanding of logistics planning that one acquires as an analyst is useful in many more-advanced positions. A successful analyst might find himself promoted to Logistics Engineer. The tasks of an engineer are related to those of an analyst: engineers evaluate the supply chain and logistics systems for trends or problems using computer systems and mathematics. While analysts make recommendations, however, engineers are responsible for implementing solutions. They manage their own projects as well as those of analysts, and must be able to write technical proposals for their plans. Management becomes an important part of many transportation and logistics careers. Consultants work directly with clients devising and implementing logistics solutions for specific problems. This often requires the consultant to be a free agent of sorts, moving from city to city solving problems; many consultants, however, find this challenge to be rewarding. Project management is a key part of consulting work; consultants must manage data to find solutions, oversee the implementation of those solutions, and ensure that clients understand basic supply-chain needs for independence moving forward. Customer service specialists are not required to have college degrees or entry-level knowledge of logistics, but the best customer service usually features both. Whether acting as a sales team or managing existing clients, customer service acts as an intermediary between clients and the rest of the logistics team. A client’s needs and concerns must be relayed to engineers or managers; likewise, if there is a problem of logistics, the problem and its solution must be communicated to the client. Therefore, a knowledge of logistics offers both clients and customer service representatives a greater grasp of the situation. As with other positions, successful customer service eventually leads to a management position responsible for establishing procedures for the entire customer service team. Not every company that employs logistics professionals will employ a purchasing manager. Carriers such as UPS, FedEx, and USPS, for instance, distribute goods or products that are ready to be sold, or already have been. Manufacturers, however, must acquire resources and materials and have them delivered for production. Purchasing managers find materials suppliers across the world, sign them to contracts, and manage relationships with them. They must also communicate with inventory and warehouse managers to coordinate the delivery of materials. While international logistics managers aren’t responsible for acquiring materials, they are responsible for maintaining relationships with international partners. International logistics requires a familiarity with ever-changing international customs, laws, and regulations. Such managers often start off working as importer-exporters and are expected to collaborate with manufacturing, marketing, and purchasing to build and manage supply chains. Knowledge of both logistics and international business are essential to the successful international logistics manager. Inventory managers oversee the accumulation of resources and material goods, and examine data for trends. They are responsible for identifying problems with inventory and implementing solutions by managing data and computer systems. Inventory managers coordinate with purchasing and logistics managers to optimize order and distribution schedules. They generally have experience with logistics and importing/exporting. If transportation and logistics is the study of distribution systems, you might expect the supply chain manager to be the king of all managers. This is not quite true, but they are very important. Supply-chain managers oversee the entire supply chain (including purchasing, warehousing, inventory, and production) and seek to streamline the system in order to reduce cost and optimize productivity. Supply-chain managers are expected to understand logistics planning in order to forecast long-term financial needs. Again, the ability to communicate, collaborate, and manage is key; if the supply-chain manager recognizes a problem, he must ensure its implementation by many other managers and departments. Learn more about studying transportation and logistics in the USA by reading our growing article collection. « Study Guide by Subject	« Study Transportation and Logistics in the U.S.
Over time we will be updating this section and including more information for those who want to study transportation and logistics in the USA and for other countries, but please feel free to post your thoughts and comments on our Facebook fan page, and also follow us and post questions through Twitter. Is a Degree in Logistics Right for You? 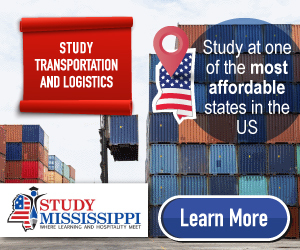 Visit the Study in the USA School search to find schools that offer programs of study in Transportation and Logistics.